It’s amazing to think that just a little over a week ago, the students and myself were performing our annual recital. All that week I was honestly thinking “Where has the time gone? Are the kids ready? Am I ready?” Of course I’m a Notorious Nervous Nelly (how about that alliteration?) when it comes to anything remotely important. Really though, it’s a very vulnerable thing to have all of your choreography and all of your students and yourself on display each year to be criticized. Mistakes and accidents are realistic to expect and if I’ve learned anything over the last four years it’s that I have to be ready for change and be able to think on my feet quickly. It never fails. Someone’s costume doesn’t fit right. There’s a snag in so and so’s tights. This one forgot her shoes. That one is feeling nervous and ready to be sick. Folks, I’ve seen it all!!! But with all of the worrying and the rough patches, my favorite moments are backstage watching the kids lined up just excited to go out and showcase their talents and then watching them from the side of the stage light up for their audience. 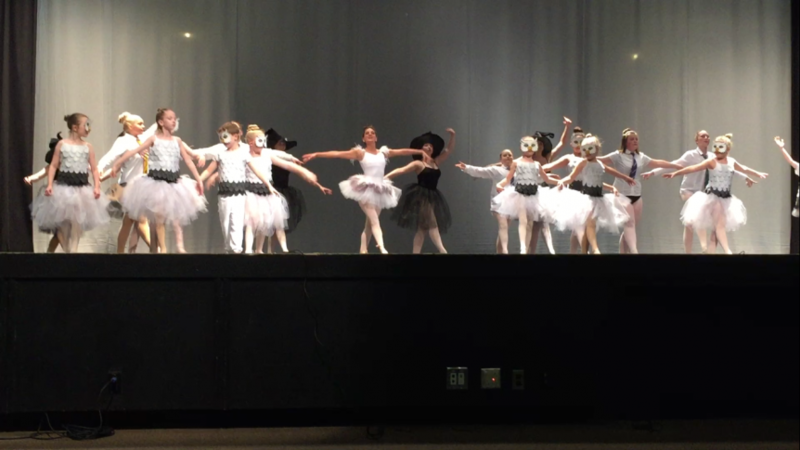 These kids take their performances seriously and I am always amazed at their dedication. This year’s show, “Hooray for Hollywood” was fantastic. No other word describes it. Out of all the years so far, this one I am most proud of and I think it’s because I’m finally seeing the benefits and rewards from the hard work I’ve been instilling in terms of technique and expression and the hard work put in by the kids who now know what’s expected of them. I of course loved all of the routines and am super proud of all of my students, but if I had to pick out some dances I had a little extra pride in, I’d have to say “The Theory of Everything” and “Soul Bossa Nova”. When I was putting together the music choices for this year, I had a hard time selecting just ONE song choice for the Theory of Everything. The music was just too beautiful and something so soft that I hadn’t quite worked with before. When it comes to modern and contemporary routines I feel like I’ve always chosen something that has a clear message or story and this one just had to be different which actually was a good challenge for me and the girls. This was a ten minute routine shown in three movements all centered around the ideas of space, time, and energy which were ideas researched and explained in the works of Stephen Hawking. We explored circular movements with the body throughout all three movements bringing them all together at the end of the third section. Even the lighting and sound directors couldn’t believe the length of the dance and just how much time it must have taken to learn all of that choreography! My thoughts exactly! Kudos to my quartet for doing the work of the professionals! nt them to feel defeated as it was only the first practice (jeepers, what is my perfectionistic self teaching these kids haha) and I remember giving them my “work speech”: With some extra work, you will nail this routine. You may just need to practice a little more, but don’t give up on it and do not tell yourself you cannot do it. By golly, within a month they were nailing the beginning choreography in terms of the movement and the musicality. I knew it was a challenging routine, but I’ve never seen a group of kids step up to the plate like these ones. That’s why I love what I do – seeing kids achieve goals they didn’t know were possible. We create so many dreams and goals in our lifetime. Some dreams stay with us through life, but we don’t always chase or reach them. Other goals we smash instantly. It’s all about our attitude and our willingness to succeed. As part of our 5 year anniversary, I wanted my students to dream big. So often I think our kids get into the small town mind frame that just because they’re from a smaller area that they can’t achieve big dreams. They feel like the little fish in the big pond. I want them to learn over the next year that any dream is possible if you’re willing to go after it and put in the work. They say if your dreams don’t scare you a little, they aren’t big enough. I have dreams for myself and the studio this year and I have to say – I’m a little afraid, but I know great things are going to happen and I am so excited to share this next year with all of my students and parents with our 2017-18 theme, “Dare to Dream”. Congratulations to all on a wonderful recital. Now, let’s chase some dreams!